FIGURE 6-5 The "midsize" oil tanker Ventiza, built in 1986. It is 247m (811 ft, or 2.7 U.S. football fields) long and 41.6 m (136 ft) wide. 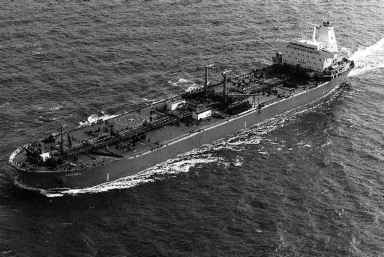 In 2000 the largest tanker in the world was the Jahre Viking, which is 458m (1504ft, or 5 U.S. football fields) long and 69m (266ft, or 0.89 U.S. football field) wide. From http://www.rigos.com/ventiza.html. Also see color insert. major impact on the local environment if the oil reaches the shore. Catastrophic spills will occur less frequently if more double-hulled tankers (vessels having a 9- to 10-ft buffer area between the two hulls) are used. If an accident perforates the outer hull, there is a reasonable probability that the inner hull will not be breached and no oil will be released. Federal legislation passed in 1990 requires oil tankers proceeding between two destinations in the United States to have double hulls and mandates the removal from service of single-hull tankers over 25 years old. There has been an upsurge worldwide in the use of double-hulled tankers. This increase is probably due more to the potential for costly ligation resulting from an oil spill than to the laws passed by the U.S. Congress. There has been a decrease in the amount of oil spilled since 1984 (Figure 6-6; see also Table 6-1). Oil tankers and other big ships have been identified as a major source of air pollution. These ships burn high-sulfur fuels that release large amounts of sulfur dioxide (SO2) and nitrogen oxides (NO*) as well as particulates into the air. The EPA plans to regulate these emissions, but international agreements will be required to enforce any such regulations. 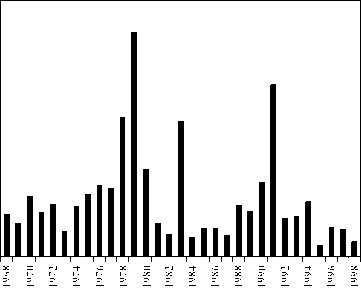 FIGURE 6-6 Oil spills over 10,000 gal (34 tonnes) since 1968. The major oil spills decreased in the 1984-1998 period. The 240 million gallons deliberately released in Kuwait during the Gulf war was the principal contributor to the total amount spilled in 1991. 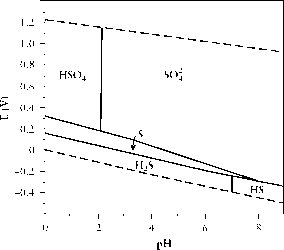 Redrawn from D. S. Etkin, International Oil Spill Statistics: 1998. Cutter Information Corp., Arlington, MA. Copyright © 1999. Used by permission of Cutter Information Corporation. was the flooding caused by Hurricane Agnes in 1972, which resulted in the release of 6-8 million gallons of sludge and oil from storage tanks in Pennsylvania.